Lord Coe will be called to Parliament to explain why he said media reports on doping were a "declaration of war". Lord Coe is the new president of world governing body the International Association of Athletics Federations. On Tuesday, Marathon world record holder Paula Radcliffe accused Jesse Norman MP of "implicating" her in the Sunday Times blood doping allegations and reiterated she has never cheated. Norman said his comments at a select committee were "taken out of context". New doping claims 'very alarming' What is doping in sport? In August, the Sunday Times published data from 5,000 athletes, which it had reviewed by scientists and said revealed an "extraordinary extent of cheating". The IAAF called the allegations "sensationalist and confusing" and denied it had failed in its duty to carry out effective blood testing. 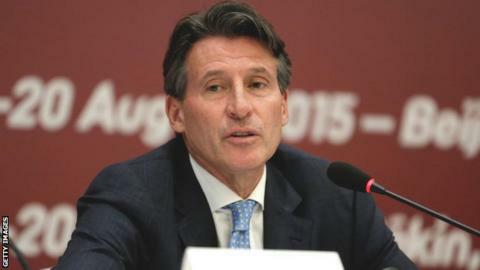 Coe, in the run-up to the IAAF presidential election, said: "The fightback has to start here. It is a declaration of war on my sport. There is nothing in our history of competence and integrity in drug testing that warrants this kind of attack." Lord Coe was also critical of the Sunday Times reports, but on Wednesday committee member Damian Collins MP said the double Olympic champion's comments were "inappropriate". Collins said Lord Coe would be called to the next committee session so that they could understand "what he actually thinks now he is president of the IAAF". Radcliffe, 41, said she "categorically" denied any form of cheating and Culture, Media and Sport Select Committee chairman Jesse Norman suggested London Marathon winners and medallists and "potentially, British athletes" were under suspicion. Radcliffe was not specifically named but she is a three-time London Marathon winner and the only British athlete since 1996 to triumph at the event. The parliamentary hearings are looking into allegations that hundreds of athletes had suspicious blood results.